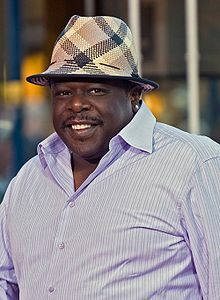 Cedric Antonio Kyles (born April 24, 1964), better known by his stage names The Amazing Cedric Kyles and Cedric the Entertainer is an American actor, comedian, and game show host. He hosted BET's ComicView during the 1993–94 season and Def Comedy Jam in 1995. He is best known for co-starring with Steve Harvey on The WB sitcom The Steve Harvey Show, as one of The Original Kings of Comedy, and for starring as Eddie Walker in Barbershop. He hosted the 12th season of the daytime version of Who Wants to Be a Millionaire in 2013–14 and starred in the TV Land original series The Soul Man, which aired from 2012 until 2016. In 2019, he will receive a Hollywood walk of fame star. Cedric Antonio Kyles was born on April 24, 1964 in Jefferson City, Missouri, the son of Rosetta (née Boyce), a schoolteacher, and Kittrell Kyles, an employee of The Missouri Pacific Railroad. His only sibling is his younger sister, Sharita Kyles Wilson, an adjunct communications instructor at the University of Memphis in Memphis, Tennessee. Cedric was raised in Caruthersville, Missouri, but after junior high school he moved to Berkeley, Missouri. He is a graduate of Berkeley High School in St. Louis's northern suburbs. While Cedric attended Berkeley High, he developed a severe rash on the top of his head, causing him him to wear a hat for most of his career. In 2005, Cedric told CNN he no longer cares about his rash and is proud of it. In 1996, Cedric moved into acting, aptly playing Steve Harvey's friend Cedric Jackie Robinson on the sitcom The Steve Harvey Show. He then began appearing in Academy Award-winning films, including Dr. Dolittle 2, Barbershop, Barbershop 2: Back in Business, Big Momma's House, Ride, Serving Sara, Johnson Family Vacation, Intolerable Cruelty, Man of the House, Lemony Snicket's A Series of Unfortunate Events, Madagascar, Madagascar: Escape 2 Africa, Madagascar 3: Europe's Most Wanted and Be Cool. Cedric was the subject of controversy when his Barbershop character made unpopular remarks about Martin Luther King and Rosa Parks. These comments were spoken in character, were part of the script, and he has never apologized for them. In the 2005 animated film Madagascar, Cedric voiced Maurice the aye aye. In October 2005, Cedric joined the Champ Car auto racing series as a part owner. Cedric appeared in the movie Charlotte's Web as the voice of Golly the gander. While his acting career grew, Cedric continued stand-up and traveled the country as one of the Kings of Comedy headliners, with Steve Harvey, D. L. Hughley and Bernie Mac. The act was later made into a film by Spike Lee, The Original Kings of Comedy. Cedric briefly had his own sketch comedy show, Cedric the Entertainer Presents, but it was canceled after one season. The show had been renewed for a second season, but Fox canceled it before the season began. He then appeared in the 2003 PlayStation 2 video game Tiger Woods PGA Tour 2004. His most recent HBO Comedy Special was Cedric The Entertainer: Taking You Higher. Two of the background dancers from the special were Kamilah Barrett and Sandra Colton, who were also finalists in Fox's So You Think You Can Dance. He also recorded comedic interludes on two multi-platinum selling albums, Nelly's Country Grammar (2000) and Jay-Z's Black Album (2003). In the 2007 comedy film Code Name: The Cleaner, Cedric plays Jake, a janitor with amnesia who may be a secret undercover government agent involved in an illegal arms conspiracy. He then starred in the 2008 films Welcome Home Roscoe Jenkins and Street Kings. Cedric appeared as the lead comedian at the White House Correspondents Dinner but jokingly remarked that he was unprepared because he thought that he would follow a humorous speech by President George W. Bush but instead followed First Lady Laura Bush, who said he was "hilarious" and "probably the funniest person" she had ever met. Cedric was inducted to the St. Louis Walk of Fame on June 7, 2008. His star is at 6166 Delmar. Cedric was the special guest host for WWE Raw on September 21, 2009, in Little Rock, Arkansas. During the show, he participated in a wrestling match, defeating Chavo Guerrero by pinfall. The match also featured Santino Marella as a guest referee. Cedric also got help from an unknown wrestler dubbed The Sledge Hammer (played by Imani Lee) and Hornswoggle. Cedric was the host of the classic American TV show Who Wants to Be a Millionaire beginning with its 12th season in national syndication, which premiered on September 2, 2013. "With his deep roots as a legendary stand-up comedian and actor, Cedric will bring his fresh approach and unpredictable fun to the show," said Janice Marinelli, president, Disney-ABC Domestic Television. On April 30, 2014, Cedric announced that he was leaving Who Wants to Be a Millionaire after the 2013–14 season to focus on his busy schedule. Terry Crews took over as host on September 8, 2014. He is married to Lorna Wells. They have two children, Croix (born 2000) and Lucky Rose (born 2003); Cedric also has a daughter Tiara from a previous relationship. He continues his involvement with his high school by awarding a scholarship each year to a graduating senior through his Cedric the Entertainer Charitable Foundation Inc. The foundation's motto is, "Reaching Out...Giving Back." Cedric majored in Mass Communication at Southeast Missouri State University and worked as a State Farm insurance claims adjuster, and substitute high school teacher before becoming a full-time comedian. He is also a member of Kappa Alpha Psi. In May 2015, he was awarded the Honorary Doctorate Degree in Fine Arts and Humanities from Lincoln University of Missouri (his parents' alma mater). ^ Andreeva, Nellie (28 July 2015). "'The Soul Man' Picked Up For Fifth & Final Season By TV Land". Deadline.com. Retrieved 20 August 2017. ^ "Cedric The Entertainer Biography (1964?-)". Filmreference.com. Retrieved 2014-06-13. ^ "Cedric 'The Entertainer' Scores in Commercials, TV and Film with Down-Home Comedy", Jet, March 12, 2001. Accessed on December 29, 2009. 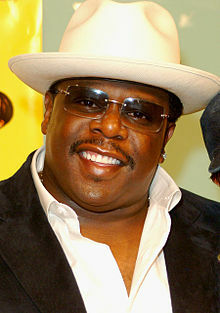 ^ "Local News: Cedric "The Entertainer," to be pararde marshal (10/19/07)". seMissourian.com. 2007-10-19. Archived from the original on 2014-11-10. Retrieved 2014-06-13. ^ "Cedric the Entertainer : Biography". IMDb.com. Retrieved 2014-06-14. ^ Munoz, Lorenza; Braxton, Greg. "Black Leaders Angered by Scene Say 'Barbershop' Needs a Trim". LATimes.com. The Los Angeles Times. Retrieved October 15, 2018. ^ "The Masked Man from Cedric's RAW Revealed, WrestleMania in Atlanta?". Wrestlescoop. Retrieved 2014-06-13. ^ "Revival of Mamet's American Buffalo Finds a Broadway Home". Playbill.com. 2008-08-19. Archived from the original on 2009-05-12. Retrieved 2015-11-01. 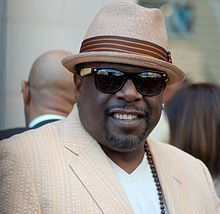 ^ Cedric the Entertainer prepares for Nashville and NBC The Tennessean. Retrieved on July 5, 2011. ^ Andreeva, Nellie (2015-07-28). "'The Soul Man' Picked Up For Fifth & Final Season By TV Land". Deadline Hollywood. Retrieved 2019-02-16. ^ "Cedric 'The Entertainer' to host 'Who Wants to be a Millionaire'". WABC TV. Archived from the original on 11 April 2013. Retrieved 20 March 2013. ^ "Cedric the Entertainer to leave 'Millionaire'". Usatoday.com. 2014-04-30. Retrieved 2014-06-13. ^ "Terry Crews Named New 'Who Wants to Be a Millionaire' Host". hollywoodreporter.com. 2014-05-07. Retrieved 2014-12-19. Wikimedia Commons has media related to Cedric the Entertainer. Cedric the Entertainer profile on Living St. Louis.